Oh, and it should be mentioned Horty has a delightful and unique sense of humor. Please email her with opportunities to exhibit, to purchase custom size prints and to comment on her work. She would love to hear for you. 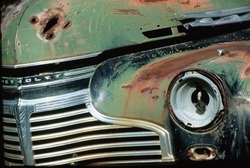 In many of her photographs, Horty Jacobs Has captured arresting abstract images of color, texture and composition that she finds in abandoned objects- trains, automobiles and buildings. She sees beauty in the faded, cracked, rusted surfaces transformed by the relentless power of time and elements. She calls these p﻿﻿hot﻿ograph﻿s, "Beauty at the End of the Line." Her large portfolio of work also includes a broad array of images, including people, animals, landscapes, flowers, rodeos, to name a few. Horty Jacobs' photography has been shown in many galleries, juried shows, and other venues, from Maine to North Carolina. Since she's lived in North Carolina, her work has been shown in the Liquid Amber Gallery, Pittsboro, the Three Rivers Arts Festival, Sanford, Fearrington Village's annual art shows, as well as been on permanent display at the Roadhouse in Pittsboro.